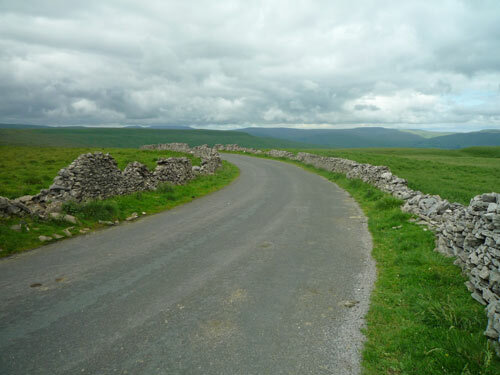 Fleet Moss is a long exposed climb between Buckden and Hawes. At it’s peak it climbs to just over 600 metres in altitude, with a maximum gradient of 20% (from Hawes). Fleet Moss looking north in direction of Hawes. Photo by Ben Freeman. 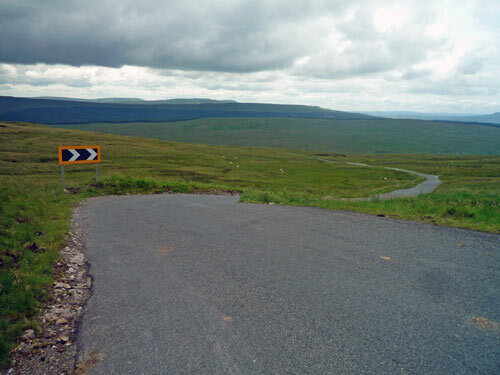 When I first got into cycling, Fleet Moss felt like an insurmountable barrier. I frequently cycled to the foot of Fleet Moss, but to go over the top would mean turning a 60 mile ride into a 90 mile ride. It meant leaving the security of the Wharfedale valley and climbing up this beast of a hill. I remember when I first went over Fleet Moss, with Otley CC, it was an epic 100 mile ride, and a big achievement to make it ‘over the top’. Fleet moss from Hubberholme (from the south) is slightly easier than from the north side. The gradient isn’t too steep – 17% at its maximum. However, it is long and persistently hard and is preceded by a long drag from Hubberholme. 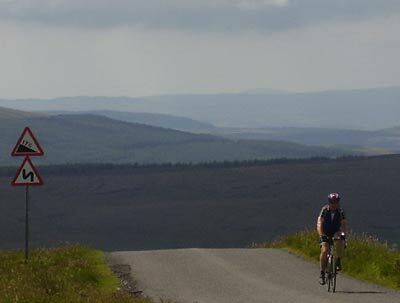 From Hubberholme to the top of Fleet Moss is 12 km, with total elevation gain of 400 metres. (net gain 240m to 602 metres). Those 12 km are at an average of 3%, but with some downhill thrown into the mix. From Buckden there is a minor road, (full of potholes up the valley floor). It is very picturesque here. There is a 4th cat climb from the valley of Deepdale towards Oughtershaw. This is mostly gentle gradient, apart from last steep section. Then there is a brief section of downhill before the climb of Fleet Moss begins proper. On Fleet Moss, you climb from 362 metres to 601 metres. It is mostly 8-10%, before a final brutal corner at the top of 17%. There’s no relent in the climb, all uphill with an average of 8.4%. Fleet Moss was one of the first times I realised I might be quite good at climbing up hills. I was an insecure 15 year old – too wary of going out with the Otley CC ‘fast’ section of quick riders. Instead I preferred to go out with the ‘A’ section (with an average age of 50+). Anyway for this particular ride to Muker, we were joined by some chaps from the Gregarios cycling club. They were great fun, and unlike the A section, seemed to think club runs should involve a few, unofficial friendly KoM competitions. At the obligatory morning cafe stop in Kettlewell, all the talk was of Fleet Moss and who would be the first to the top. Some of the elder members of the A’ group smiled into their pots of tea; racing wasn’t for them. But, the Gregarios were jovially building up the great climb. I was quite excited to be going up Fleet Moss because it was a real adventure. I very rarely climbed anything like Fleet Moss; to a 15 year old unaware of Alpine climbs, Fleet Moss had an almost mythical allure. We cycled up the valley from Hubberholme to the foot of Fleet Moss. I sat at the back of the pack. At the end of the valley, you turn right, there is a short steep section, but it then plunges back down before beginning the climb proper. It makes a good view as you can see the climb snaking sharply up the hill. At half way up the climb, I shot off – like I was in a road race. I soon caught up with a caravan who was struggling up the 17% slopes. But, despite getting stuck behind a caravan I made it to the top first and got my first, very unofficial KoM! On the way back, with 80 miles in the legs, the Gregarios got their own back and beat me up the reverse of Norwood Edge. I had never cycled so far. But, it was a memorable cycle ride. On the South side, from Fleet most to Hawes is even steeper. There is a nice straight fast descent (20%). If you like descending quickly, it’s worth making sure you don’t get stuck behind a car. Fleet Moss from Hawes south is probably the harder climb. It is longer and steeper nearer the top (it makes a great descent by the way. There is a long stretch of straight uphill (they don’t bother building hairpins in this part of the world. As the climb goes on, it gets steeper and steeper, so you need to save something in the tank. The last section is 20%, but that’s after quite a lot of hard climbing. 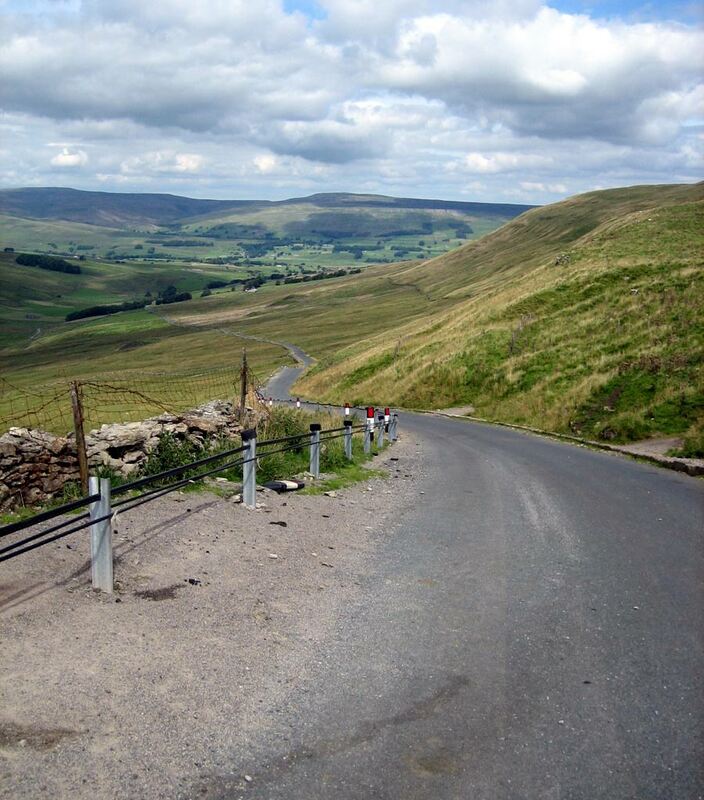 Park Rash – One of the steepest climb in Yorkshire Dales from Kettlewell.